Season the veal shanks, heat oil in a pan and sear the veal until brown. Avoid crowding the pan and sear the veal in batches if necessary. When the veal is finished browning, set aside and rest on a plate. Whilst the veal is browning, saute all the vegetables and tomato paste in the pressure cooker and season. When the vegetables have softened, add chicken stock and wine. Give it a good stir, scrapping the bottom for any bits and bring to a high heat. Once this is heated through, add the veal shanks to the pot and ensure they are tucked into the mixture as much as possible. Add the rosemary, bay leaves and top with the canned tomatoes. Ensure that you do not stir this through to avoid the diced tomatoes catching at the bottom. Lock the lid on the pressure cooker and cook at high pressure for 30 min. After 30 min let the pressure come down naturally for 10-15 min. When the time is up, release any pressure left in the pot and voila! Serve with a side of mashed potatoes/polenta, tuck in and enjoy! If you don’t have a pressure cooker. Add an extra cup of chicken stock to a heavy based pot with a lid. Bring the ingredients to the boil and cover the lid. Place the pot into the oven at 180 degrees for 2 hours. You can substitute the veal w beef shanks, chuck steak, lamb or chicken. It will still taste great! Oh man there’s just something about osso bucco that is so comoforting on a cold winter’s night. I’ll need to try this with my pressure cooker also. It’s about the only thing I’m looking forward to this winter…. Def give it a shot. It is incredibly tasty and so easy. Something really satisfying about easy & tasty! 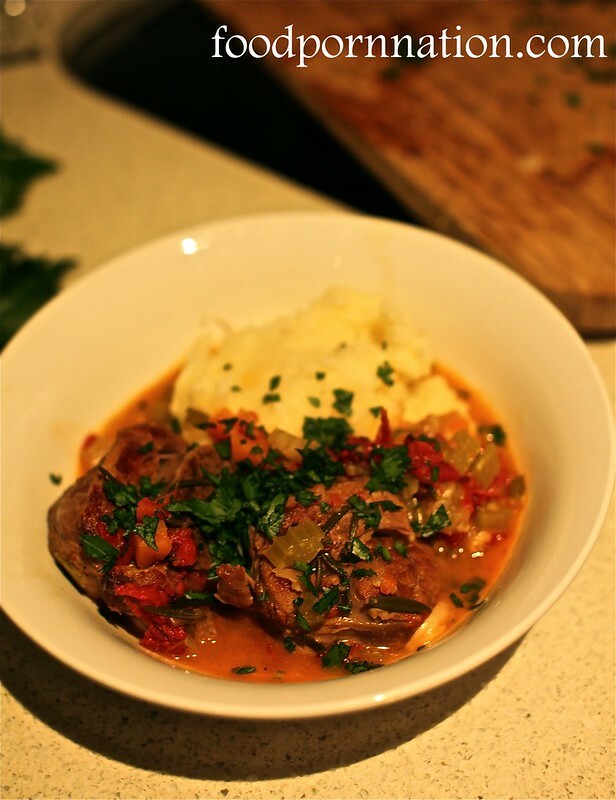 Osso bucco has been one of my favourite ‘company dishes’ for many decades. One of the ones I am known for 😉 ! I slowcook it, but pressure cooking may give the same consistency. Unfortunately you have not given the most important part of the recipe here: that of the vital gremolata without which the dish is but a stew! Also I DO wish where to find proper veal shanks pieces in Sydney or environs as most sold is beef or yearling which simply will not do 🙂 ! It gives the same consistency, you just need less liquid because the liquid doesn’t evaporate. I didn’t try the gremolata so I didn’t feel appropriate including it. But I’m hearing more and more feedback that it is an absolute must. I think you have convinced me to try it. Try Hudson Meats for Veal Shanks, they have a paddock to plate philosophy. All meat is locally sourced from local farmers and all animals have lived a happy life. You can really taste the difference. It’s not cheap but it is well worth supporting humane farming! Oooh looks good. After having osso bucco at Cafe Sopra I’ve been so tempted to cook it myself. I’ve never cooked with a pressure cooker before though. Must try it out! It is wonderful when you do. You just pop everything in, close the lid and walk away. I think it’s one of the best things I have ever bought! lol i still get nervous using my pressure cooker but will have to break it out more often this winter for sure! I know it can totally nerve wrecking!!! I think that’s why I prefer the electric ones better. You don’t have to regulate/monitor it as much. 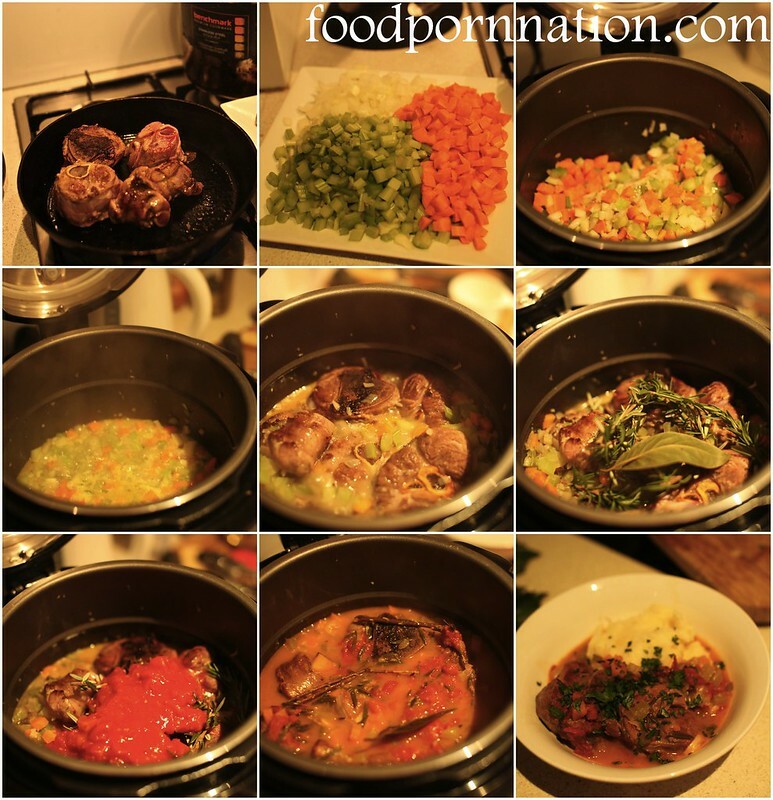 Priscilla…I dreamt about your osso bucco last night after reading your recipe. I need to try this so badly! this osso bucco looks amazing! my mum makes soup with it, but your pressure cooker recipe looks amazing! Hi Lee, this serves 4 people. But can multiply the quantities to suit the number of people you are serving e.g. 1.5 x below ingredients to make 6 serves and so on.